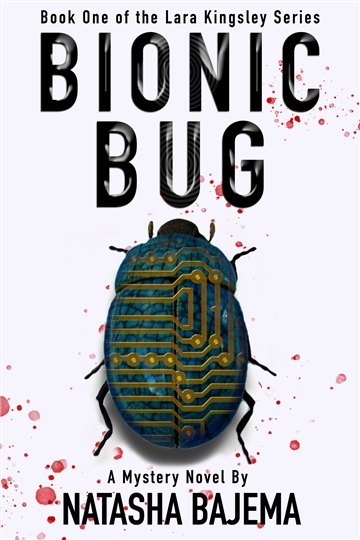 Amateur Detective Lara Kingsley must sacrifice everything to stop a rogue scientist from unleashing the ultimate biological weapon—a deadly swarm of bionic bugs. When Lara starts up her business to install surveillance systems for wealthy clients, she never imagines having to solve any grisly murders. That is, until her best friend and fellow private investigator drops dead before her eyes. Lara begins a harrowing search for her friend’s killer and uncovers far more than she bargains for. Racing to unravel the mystery, she finds herself becoming deeply entangled in a new technological world of drones, gene editing, and the Dark Web—the notorious underground of the Internet. To solve the murder, she must enlist the help of the scientist himself while trying to stop him from killing thousands of innocent people. From long-time national security expert, Natasha Bajema, comes an action-packed mystery novel, the first in a series that uniquely weaves together elements of mystery, techno-thriller, and speculative fiction. Natasha Bajema is an aspiring author and lives in Washington, D.C. with her two dogs, Malachi and Charlie. She has been an expert on national security issues for over 18 years, specializing in weapons of mass destruction (WMD), nuclear proliferation, terrorism and emerging technologies. She works for the National Defense University where she teaches an elective course to senior military officers on WMD and film and leads a research project that explores the impact of emerging technologies on national security. Her past work experience includes extended assignments in the Pentagon, the Department of Energy and the United Nations. Her publications include two co-edited volumes entitled Terrorism and Counterterrorism and Weapons of Mass Destruction and Terrorism, both of which were published by McGraw Hill. Natasha holds an M.A. in international policy from the Monterey Institute of International Studies and a Ph.D. in international relations from the Fletcher School of Law and Diplomacy.